Are you missing most of or an entire row of teeth? Do you have a denture that you just can’t trust to stay in place, and it severely limits the types of food you can chew? 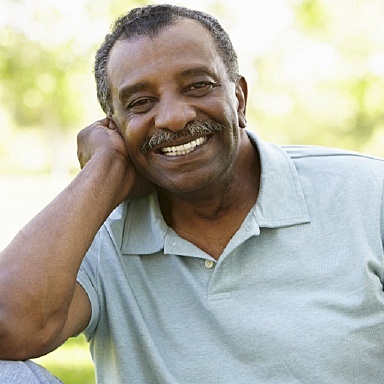 What if you could replace a whole row of missing teeth with a denture that’s guaranteed to look natural, stay secure, and last for years to come? What if you could get it in just one dental appointment? Would you be interested? If the problems touched on above even sound remotely familiar, we’re sure you are! Working with a “dream team” of local specialists, Dr. Allan Mohr can use All-on-4 dental implants in Massapequa to help patients get an implant-retained denture in just one well-planned appointment, helping people rebuild their smiles in record time. Why Choose Dr. Allan S. Mohr for All-on-4/Teeth-in-a-Day? All-on-4 uses just four strategically placed dental implants in order to support a full denture. This is a much faster and cost-effective way to replace a large number of missing teeth versus using an individual implant per tooth. Two implants are located within the front of the jaw where the bone is naturally thicker, and two more are placed at an angle towards the back. 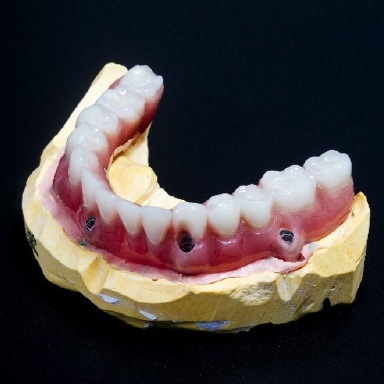 They all work together to provide an extremely firm foundation for a denture that simply snaps onto them, giving patients a security a typical removable denture simply can’t replicate. What is the All-on-4 Procedure Like? As with any dental procedure, All-on-4 starts with a call to your Long Island implant dentist, Dr. Mohr, for a consultation. At this appointment, he’ll take a few X-rays of your jawbone and examine your mouth in order to determine if you are a good candidate for the procedure. If you are, he’ll then discuss how your particular treatment process will go. Typically, it will begin with him taking an impression of your bite so he can begin to design your new denture. He’ll also take a variety of scans over the course of a few follow-up appointments in order to determine the best locations for your implant posts. Once this is all ready, he’ll refer you to a local oral surgeon or periodontist to place the implants and attach the denture. Dr. Mohr works extremely closely with all of his specialists, so visiting them will feel like just another appointment with Dr. Mohr. After thoroughly numbing you, your specialist will position the implant posts within your jawbone and immediately load them with your dentures. Afterward, you may experience some soreness and swelling near your implants, but these symptoms should be easily managed with over-the-counter medicine. For the first few weeks, you’ll be advised to stick to a soft food diet in order to allow your implants ample time to bond with the surrounding bone. Once enough time has passed, you’ll be able to fully enjoy your renewed smile, eating your favorite foods without ever having to worry about your prosthetic. Dr. Allan Mohr's experience as an implant and cosmetic dentist spans over 30 years. His advanced training, unparalleled credentials, and meticulous eye for detail are what set him apart, and his best patients love him because he truly goes above and beyond in everything he does. If you are looking for the best quality All-on-4/Teeth-in-a-Day dental implants on Long Island, look no further: Dr. Mohr is the dentist for you. Explore the stunning before and after images below, and when you are ready to have a smile transformation of your own, give us a call. Dr. Mohr accepts complimentary, 1-on-1 dental implant consultations to talk about your options and develop a custom treatment plan. We also are offering a limited-time special: monthly dental implant payment plans, as low as $199/month. Thanks to All-on-4 dental implants, you no longer have to deal with an uncomfortable denture or multiple missing teeth day after day. In just one appointment, you can literally get a completely new row of teeth that will look and feel great for a lifetime. To learn more about All-on-4 and see if it could work for you, give us a call today.